This sleeve has a real name. I'm sure of it. Unfortunately, I don't know it. If you do, please say so in the comments so we (i.e. me) can all learn, okay? Thanks! Until then, however, I'm just going to call it the cut-in horizontally pleated sleeve. So... back to drafting this sleeve with the very catchy name. does not have excess ease. In other words, if cut out in fabric and sewn into an actual sleeve, it would be like a close-fitting shirt sleeve. 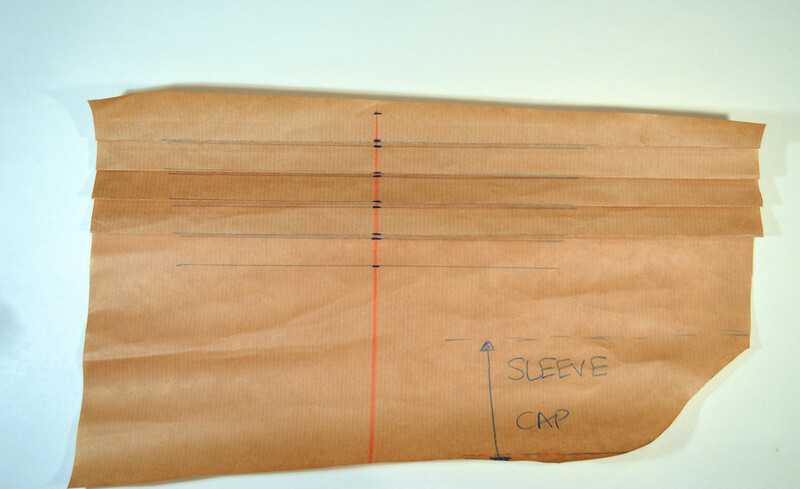 The length of the sleeve is not defining in a sleeve block - it's just the shape of the sleeve cap that counts, because from the armpit downwards, you can lengthen, shorten, flare or taper it without affecting the fit at the sleeve cap. has a distinct front and back section. I have not seen many commercial sleeve patterns but I have heard that they are often completely symmetrical front-and-back. Were they sleeve blocks, this would be paticularly appalling. 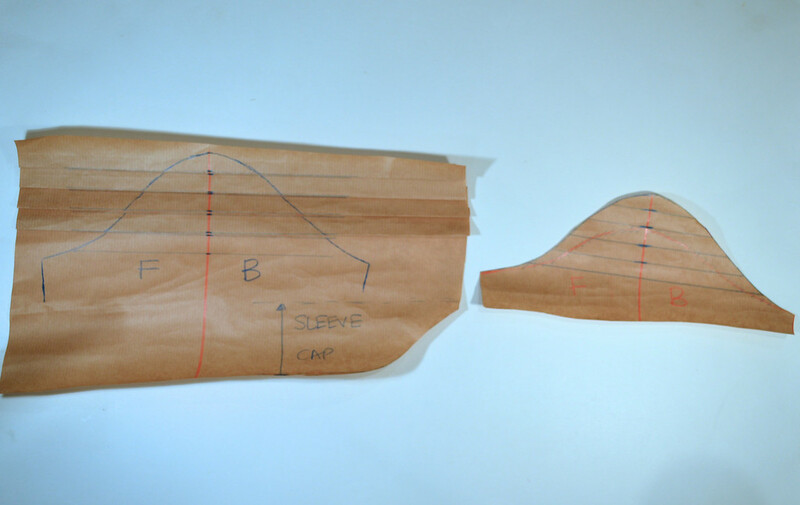 However, by the time a sleeve pattern gets into your hands from a pattern packet, it is no longer a sleeve block - it has been modified, adapted and had ease added to make it a sleeve pattern. And puff sleeve patterns, especially, which are veritable ease-fests, are so voluminous compared to their original sleeve blocks that I could see why maybe, just maybe, some people might tolerate them being front-and-back symmetrical. To me, though, it still feels like the equivalent of sewing a pair of pants that have the same pattern for the front (no buttocks) and back (with buttocks) simply because it's a loose design. No. Just no. 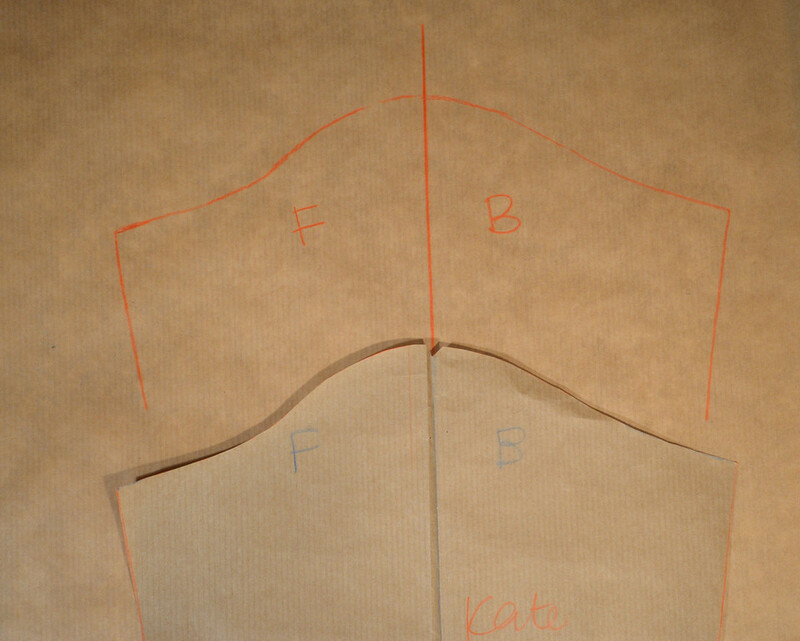 So anyway, this is Kate's sleeve block. We're going to be modifiying it, so it will need to be redrawn a few times as we change it. 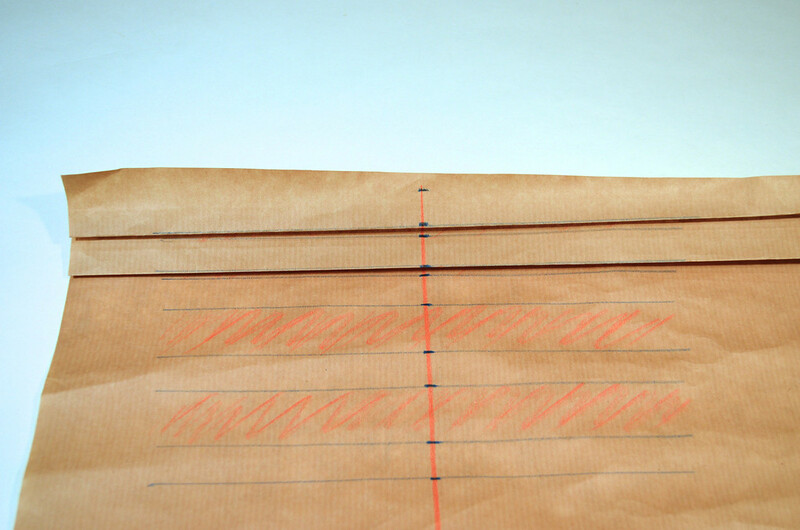 Begin by drawing one vertical line on paper. This is the center line of the sleeve. Trace the sleeve cap portion (that's the rounded mountain thing) and a bit of the side seams. Put away the original sleeve block - we'll be working with our trace for the next few steps. We're going to do adapt it in two ways. 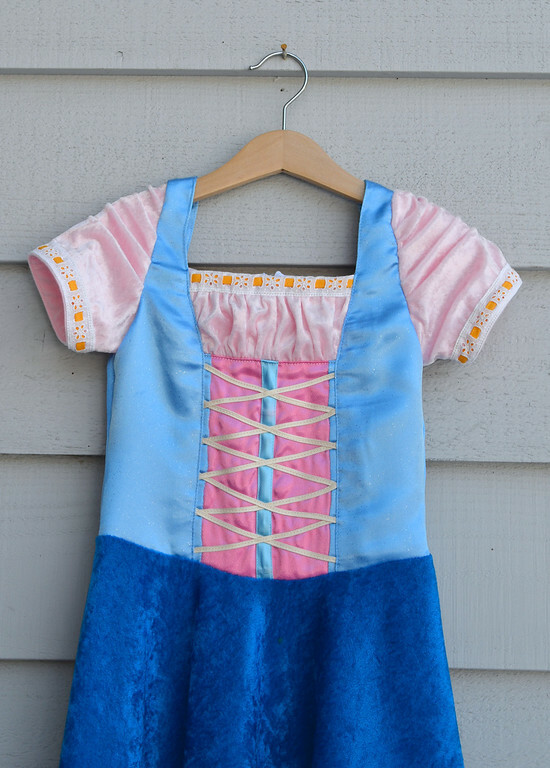 The first is in direct response to something we've done to the bodice. 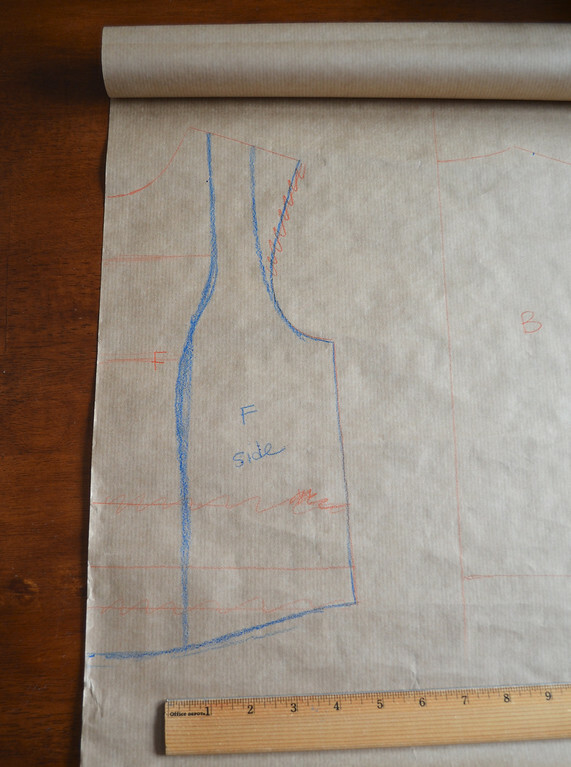 Let me refresh your memory by repeating a photo from the previous post, in which we drafted the bodice with this cut-in armscye. Remember how we shifted that shoulder strap about 1 1/4" towards the neck to make a new, false shoulder point? 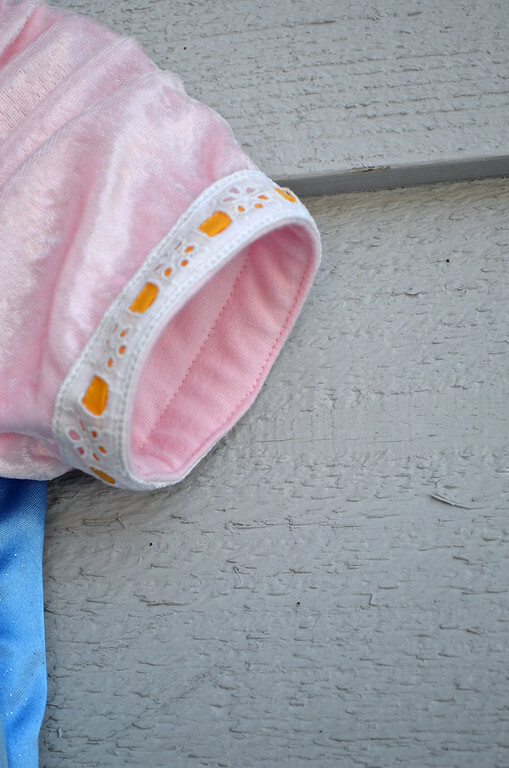 and draw in the top-of-the-sleeve-cap (in blue). 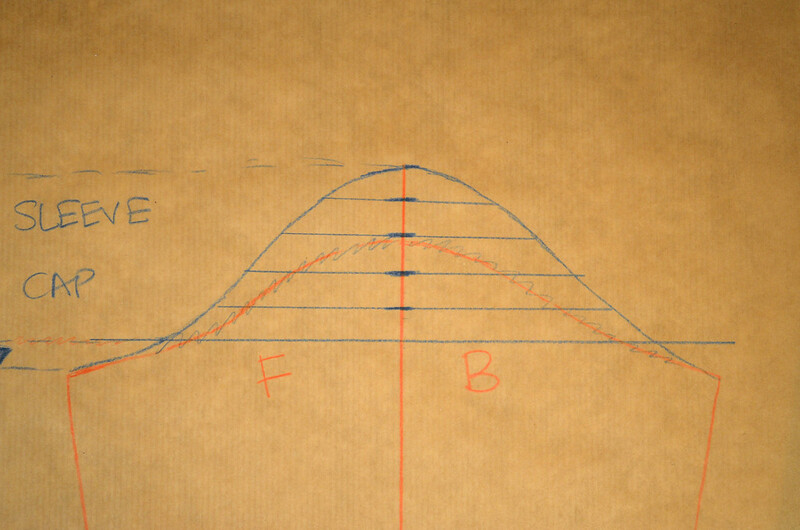 Remember, as you sketch it in, to make the front different from the back - curvier, deeper. Scratch out the old sleeve cap. I'm going to repeat stuff from the previous post now, just so we're both on the same page. Here's what I mean by "cut-in" when I refer to this sleeve. In the photo below, Kate's shoulder point is indicated by the enormous blue arrow. If this were a normal set-in sleeve, the armscye would pass over that point. 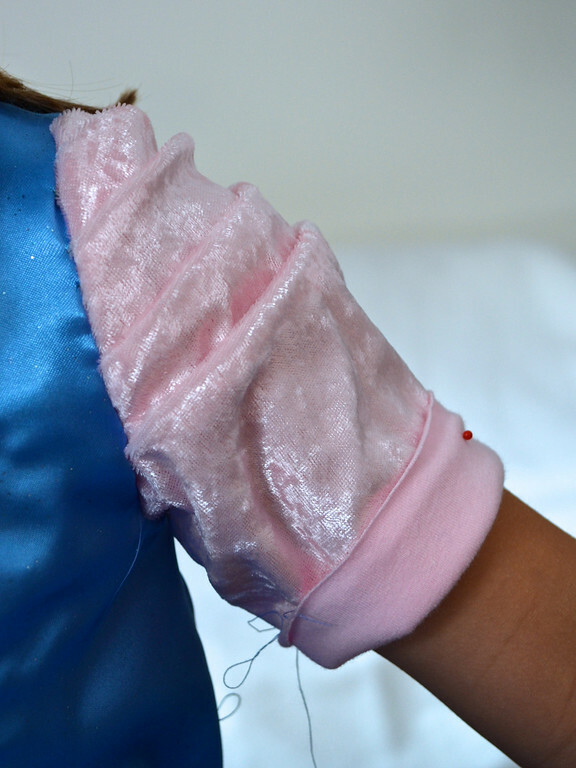 In other words, the seam where the pink sleeve joins the blue shoulder strap would pass over that shoulder point. 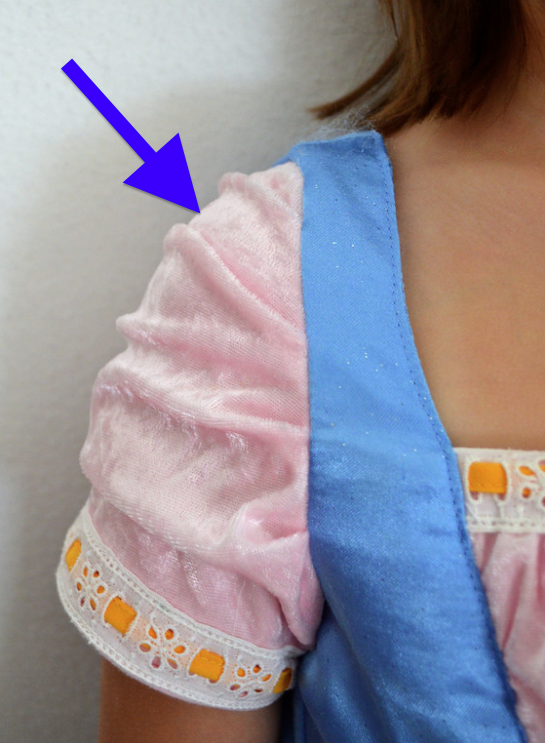 In a cut-in sleeve, however, the armscye has been shifted towards the neck so that the sleeve cap covers more of the shoulder and the strap, subsequently, is less likely to slip off the wearer's shoulder. Modification #2 is to add pleats to the sleeve, for texture. 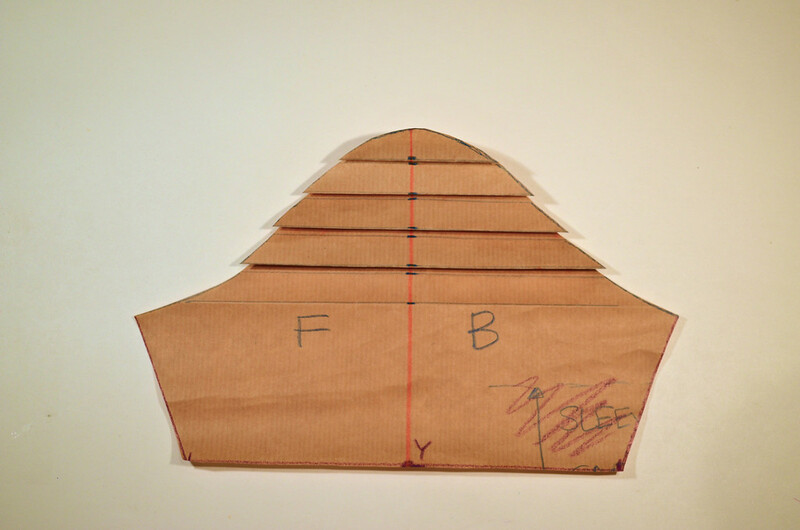 If you've drafted a puff sleeve from a basic sleeve block (see our tutorial here), you'll know that it's as simple as widening or fanning out the sleeve cap to incorporate ease, which then manifests as vertical waves when you gather that sleeve cap back into its original shape. Our pleats today are similar, except they're horizontal rather than vertical. So not scary, right? 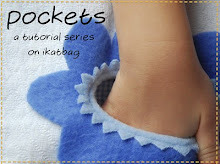 The first thing to remember is that, with puff-type sleeves, all the action typically happens only in the sleeve cap. So let's divide the sleeve cap into half-inch sections. I managed to squeeze in 5. A: Arbitrary. I thought the pleats would look nice if they were about a half-inch apart. Next, cut that whole sleeve out. We're only interested in the sleeve cap, remember, so I didn't bother to include any more than an inch or so below the sleeve cap. Set this aside. We're now going to make pleats. Find some new paper. Or old paper. Or any paper. 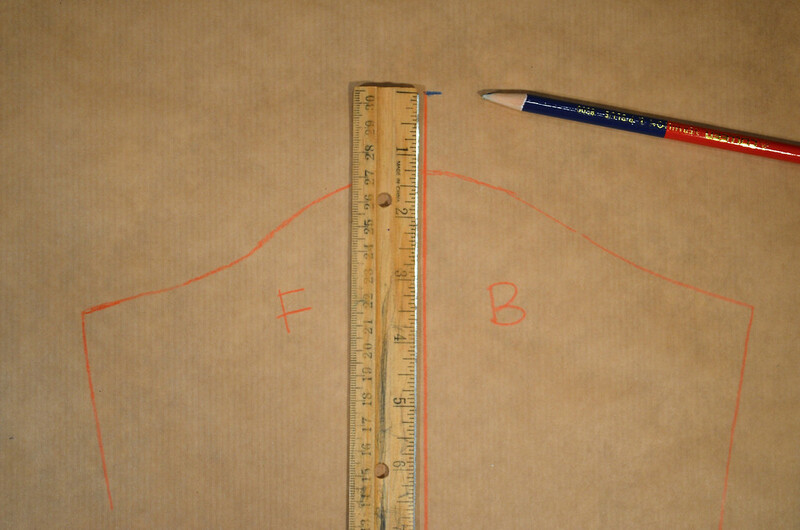 Draw a vertical line in the middle, for the center line of the sleeve. Mark out 1/2" marks, separated by 1" marks. 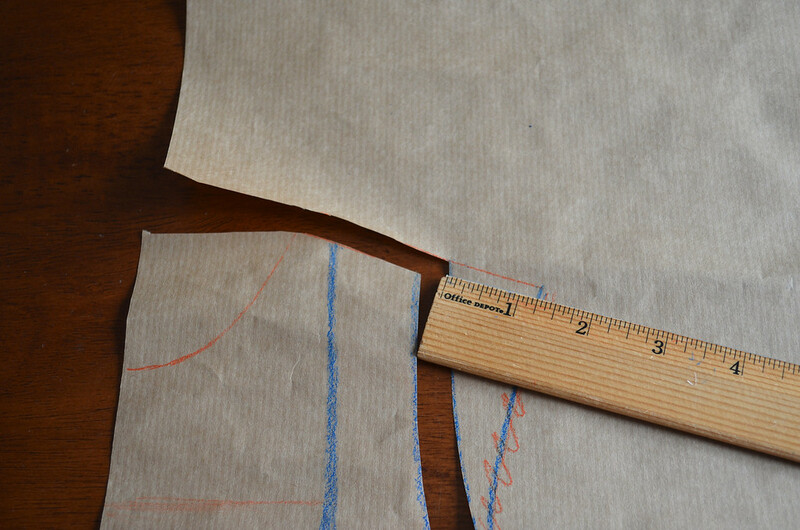 The 1/2" marks will correspond to the ones on the sleeve cap you just cut out. 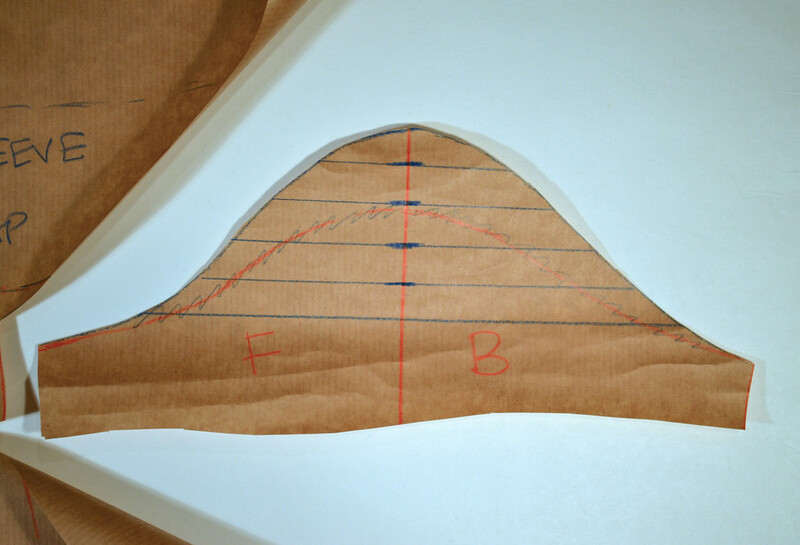 The 1" marks will be the folds that become the pleats. I made five 1/2" marks (with four 1" marks between them) because that's how many 1/2" marks were on the sleeve cap. A: Symmetry. 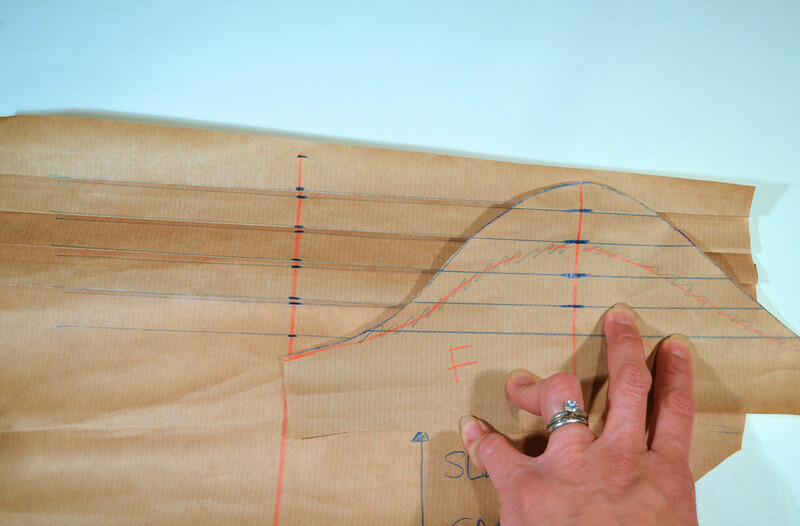 1" would pinch into a 1/2"-deep pleat, which is the same as the spacing between the pleats themselves. This gives nice, even pleats. You could always make them deeper (i.e. use more than 1") or shallower (less than 1") if you like. 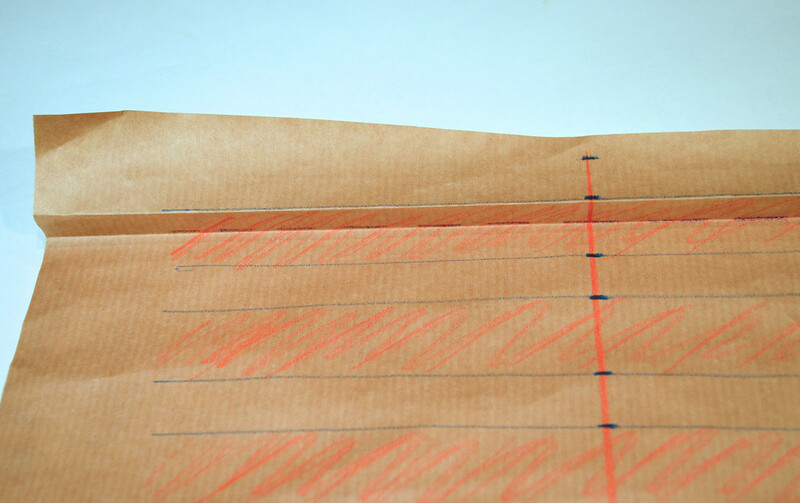 Draw horizontal lines through all the marks, dividing them into 1/2" sections and 1" sections. I've shaded the 1" sections in red just for visual effect. We're going to accordion-fold the 1" sections so that they are hidden away. See that purple dashed line? 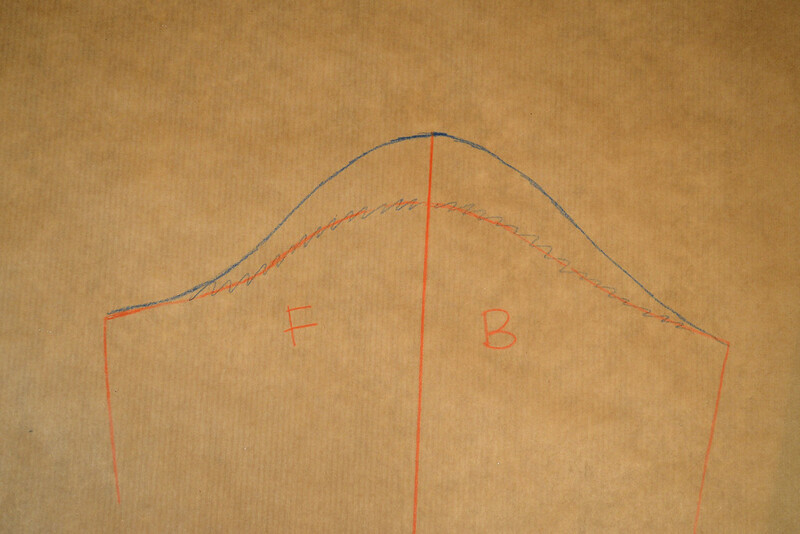 We'll valley-fold on that and mountain-fold on the blue lines flanking the red shaded region. and the third and fourth, until all the 1" shaded regions disappear and you are left with only the 1/2" sections visible. 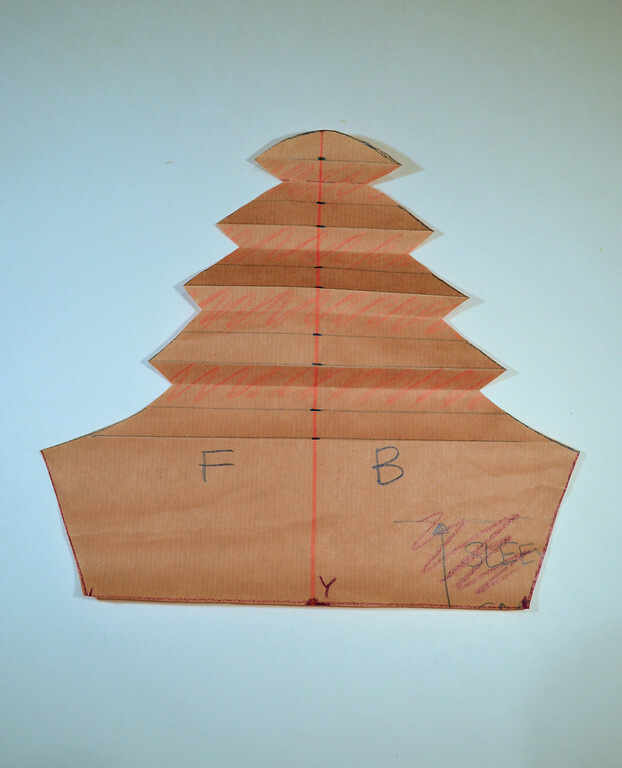 Place the sleeve cap on your accordion-folded paper, lining up the horizontal 1/2" folds. 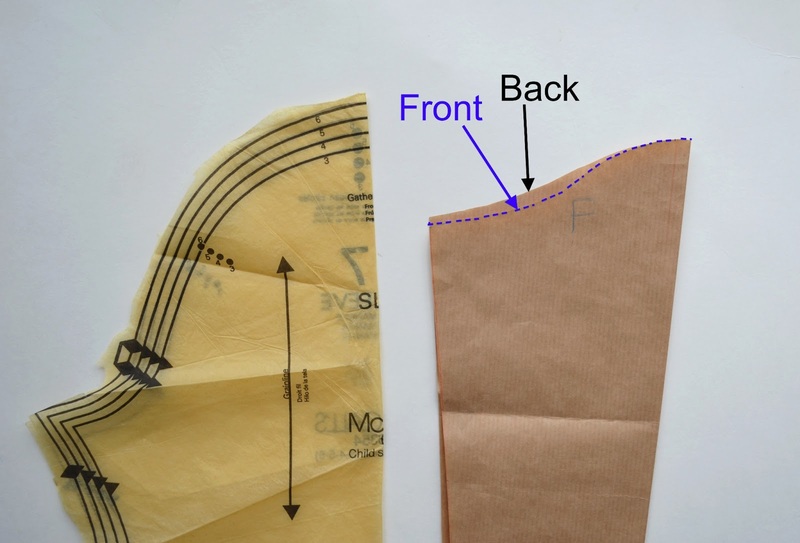 Shift the sleeve cap sideways until its vertical center line lines up with the vertical center line of the accordion-folded paper, and trace the outline of the sleeve cap onto the accordion-folded paper. You've just introduced pleats into a regular sleeve cap. Hurrah! Now let's draw the rest of the sleeve and then we can cut out our new pattern. 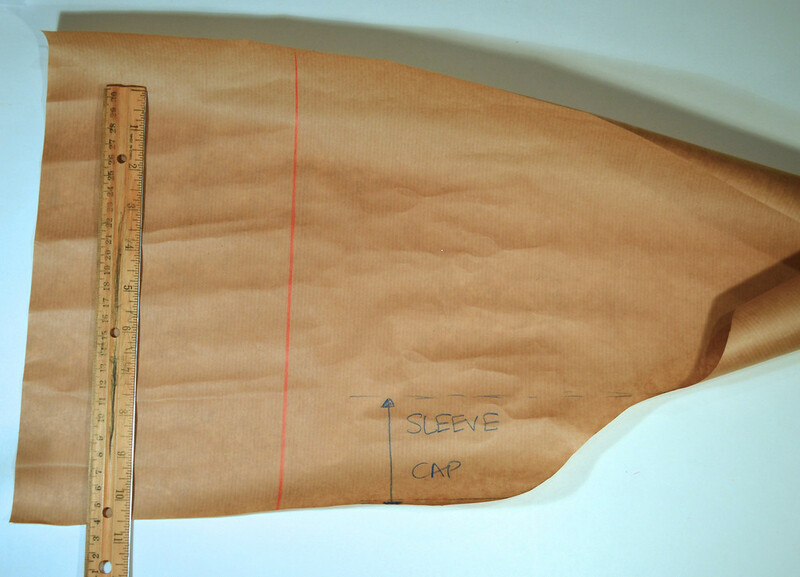 Measure (on the wearer) how long you want this sleeve to be from the top of the sleeve cap to the hem of the sleeve. That will be the distance XY. 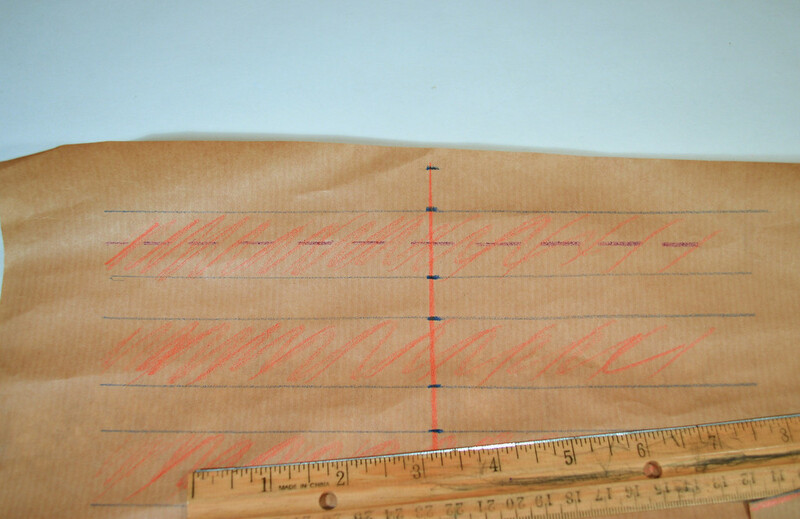 Mark it on the center line of your pattern and draw a horizontal line across Y. This is your sleeve hem. 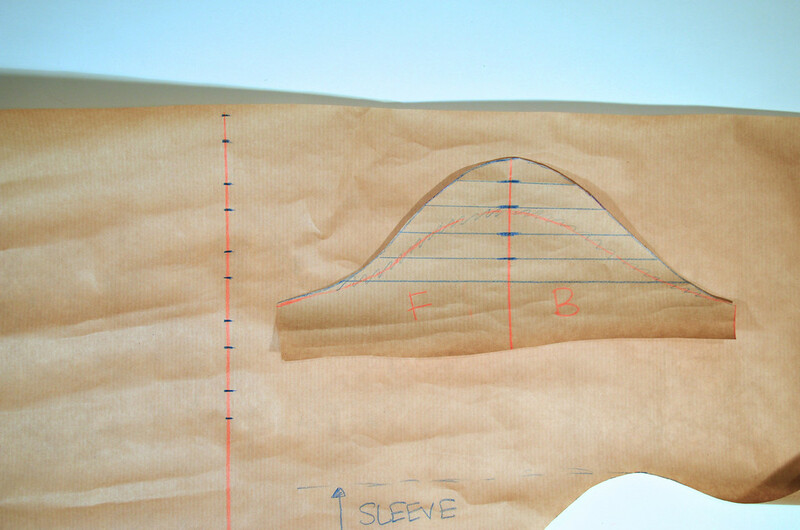 Now measure around the wearer's arm for an indication of how snug you want this hem to be. 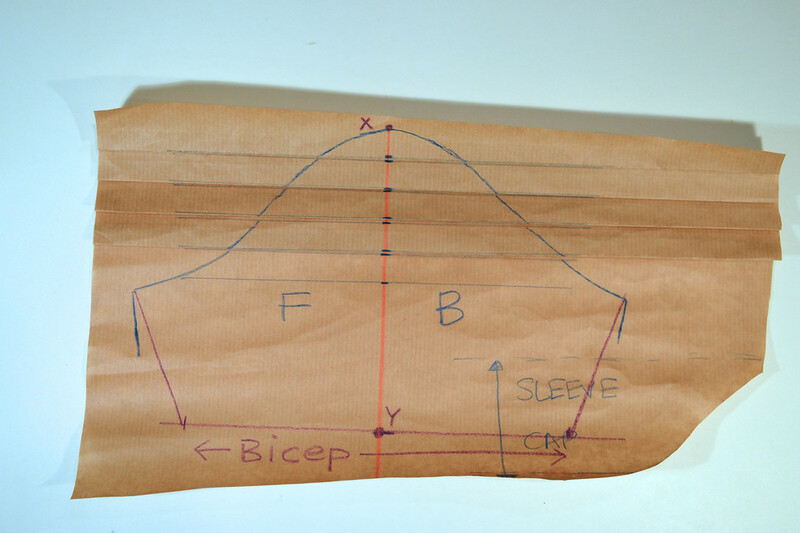 My sleeve ended at Kate's bicep, so I measured around her bicep comfortably and marked this distance symmetrically about the point Y. 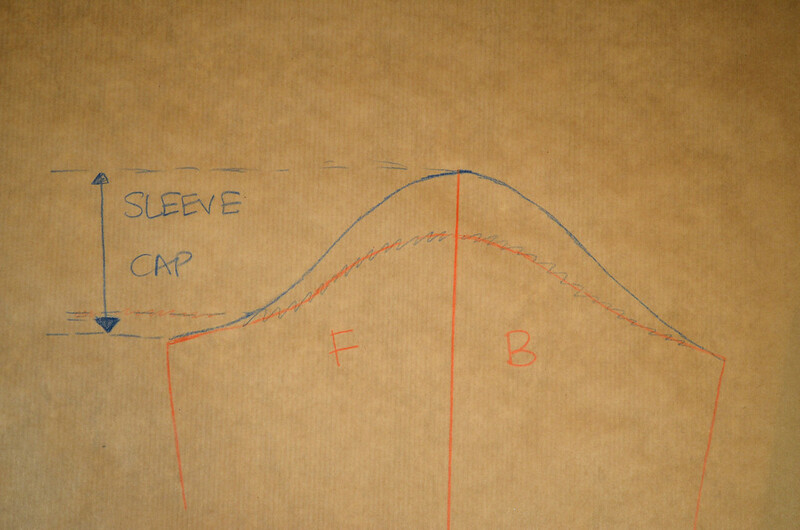 Then I drew the purple slanty lines from the bottom of the sleevecap to the hemline to form the side seams of the sleeve. 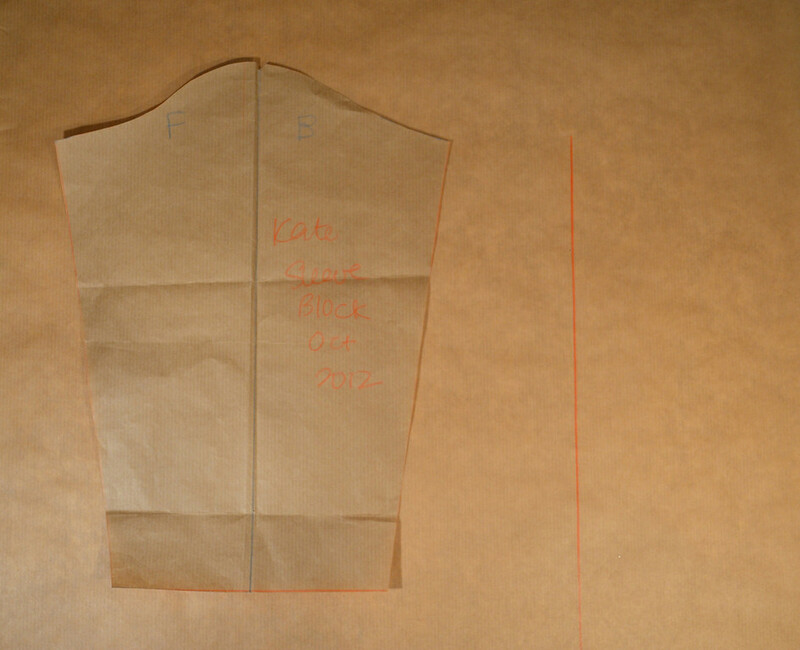 Cut it all out - this is your horizontally-pleated, cut-in sleeve pattern. Open it out (you know you want to!) - it looks like a Christmas tree! Last step - notch the top of the sleeve cap in two places: one exactly at the center line, to mark the center of the sleeve, which should connect with the shoulder seam of the bodice. And two, anywhere along the back half of the sleeve cap - when you reproduce this mark on your fabric, you will know which half is the back and which is the front. 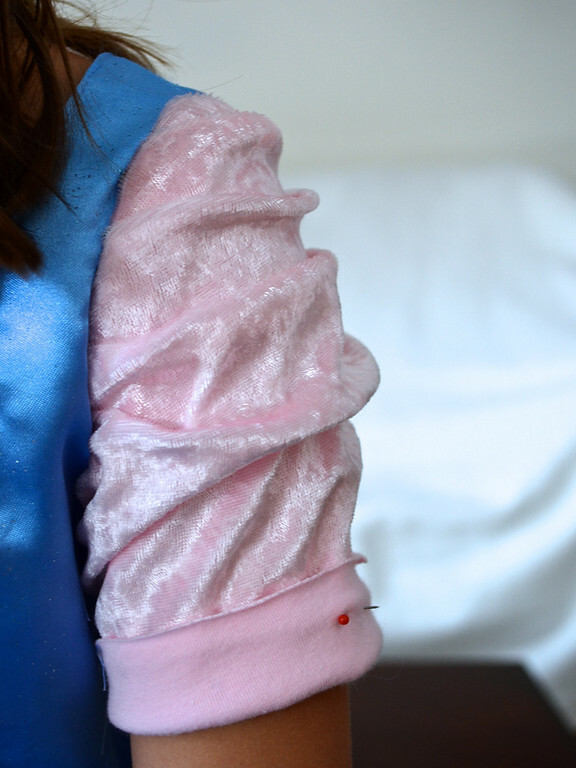 You could probably sew this sleeve as a single layer and have it drape and puff dramatically -if a bit untidily - but I chose to stabilize it with a lining. The lining is unpleated. 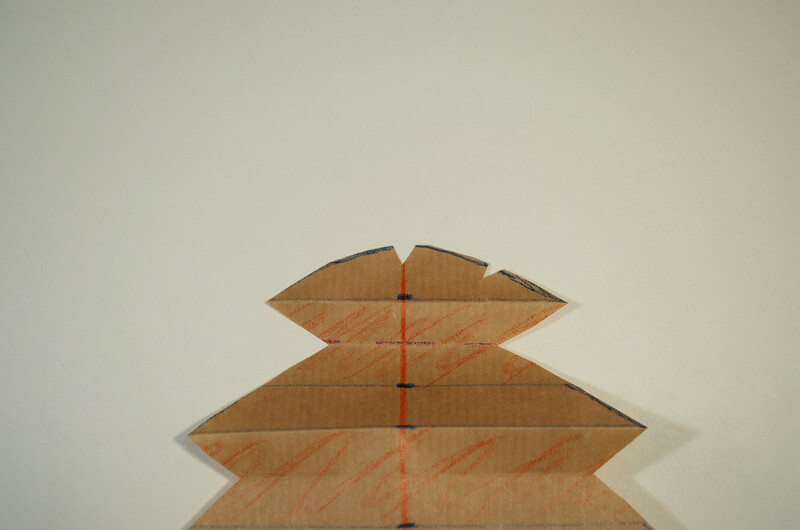 It is cut using the same pattern, but folded up (i.e. closed pleats). 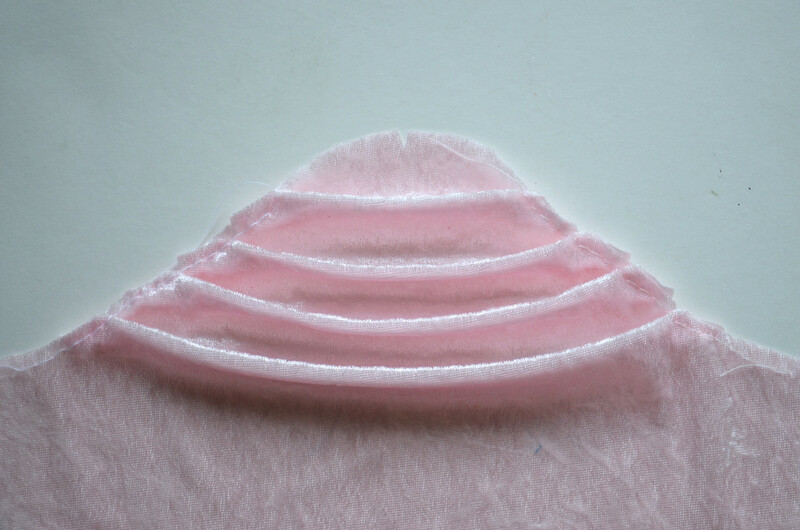 When sewn together, the drapey pleats on the outer layer will remain even and neat and not spread out and disappear. Summary: With the lining, the pleats are largely for texture, since they can't really open out. 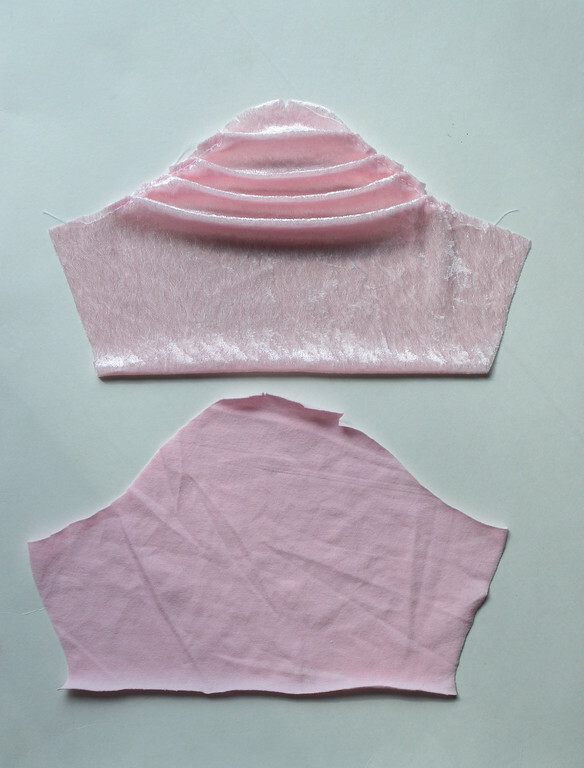 Without the lining, the pleats will also provide volume, since they will spread and open out. 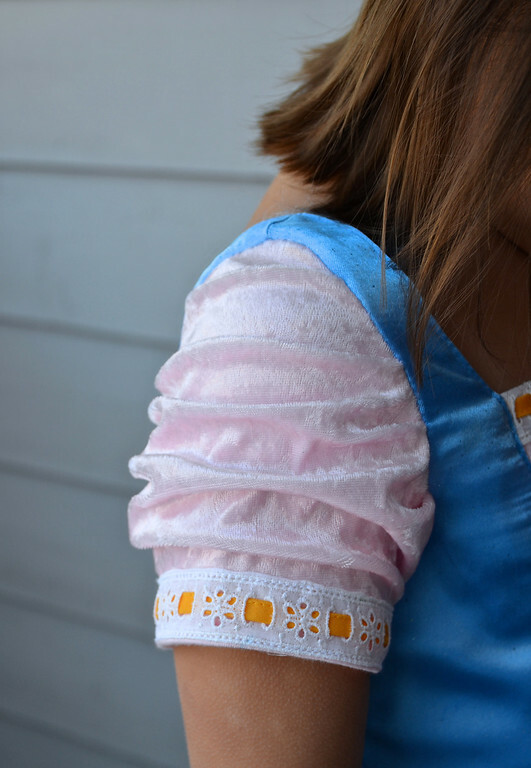 Everything in this sleeve is stretchy because it was made for comfort for a little girl who likes acrobatics even while being a princess. The outer sleeve is made from velour and the sleeve lining is jersey, so the entire sleeve, while fitted, is still stretchy. And since the pleats are stabilized by the sleeve lining, they don't collapse when the arm is raised or lowered. Another happy side-effect of lining the sleeve - no icky raw edges at the seams or hem. Here is the finished sleeve - looks puffed but isn't. And it happily coordinates with the ruffled bodice bit above the corset. Viability report: Kate wore this dress for four straight days after being presented it. Then she took a break from because (she explains), "I want to save it. I'll only wear it for birthdays and Easter and Christmas and ... seasons." I hope Halloween counts as a "season" because, if so, I've finished her costume 7 months in advance. Unheard of! You make something that looks difficult and complicated actually become simple. I love it! Thanks for sharing, great idea! Love it! I don't think I've ever seen a DIY sleeve like that on a child's garment, but if it can be made on runway stuff then why not for reals? LiEr, why are you not writing a book? 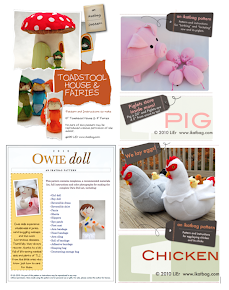 This would be awesome in a book but in a scroll-down bloggy mode, it makes my eyes cross. Seriously, a book, please? This post and your previous one about this dress have taught me so much. Thank you, LiEr!